If the movie La La Land got you excited to explore Los Angeles and see all the places featured, this La La Land photo tour will show you exactly where to find all the real landmarks and shooting locations. The movie is a love letter to Los Angeles and the dream of making it big in the city. It shows off some of the city's major landmarks and some often neglected gems. You can visit most of the places yourself, including shooting locations that stood in for fictional settings. 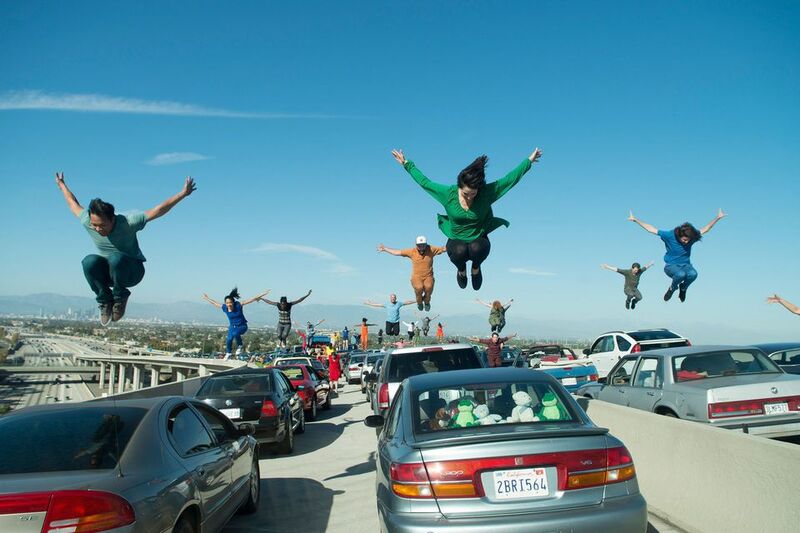 The movie opens with a song and dance number in a traffic jam on a freeway ramp. The scene was filmed on the eastbound 105 freeway transition to the 110 freeway. You can't stop there to take a photo, but if you take the Metro Green Line to the Harbor Freeway Metro Station or park near 11500 S. Figueroa and walk or take the elevator up to the platform, you can get a similar view over the freeway. The Warner Bros. Cafe where Mia works does not really exist. It's a set created on the Warner Bros. Studios backlot. They recreated it briefly to be part of the Warner Bros. VIP Studio Tour Hollywood, and if you go on the tour after it's gone, they'll point out where it was, but it won't look like the set any more. You could conceivably run into an occasional celebrity at the Warner Bros. Cafeteria, which is in the same building as the Visitor Center where tours begin. Later in the film, Mia takes Sebastian on a tour of the backlot and soundstages, which you can also visit on a studio tour. The exterior shots of Mia's pink apartment building were shot at El Cordova apartments, a condominium building on 3rd Street in Long Beach. They filmed a much longer sequence of the girls dancing down the stairs from apartment 16 and through the courtyard to the street, which you can see in this video about Long Beach filming locations, but only a quick clip of them dancing out into the street was kept in the film. The colorful interior apartment shots were filmed elsewhere. If they had lived in apartment 16, it would have been very cramped since that's a one-bedroom apartment. If you stop by for a selfie, be sure to head around to Bird Lane, the alley in back, where Sebastian picked up Mia in his red convertible and turned the wrong way onto one-way Gaviota Street. But be sure to turn the right way! They never specify what neighborhood Mia lives in. Would a budding actress be living in Long Beach? There certainly are some who do because of the more budget-friendly rents, but most prefer to live north of the 10 Freeway for easier access to auditions, which tend to be in the Valley. There are several montages in the movie that pack a lot of landmarks and sights into just a few seconds. The first one is as the girls are driving along the 101 freeway through Hollywood we see a montage of iconic neon signs - Paty's Toluca Lake, Musso & Frank Grill and the Roxy are all real places that you can check out for yourself. Formosa closed in early 2017. There are a couple other neon signs like the Wilshire Royale and the Knickerbocker that are private apartment buildings. The location of the modern Hollywood Hills mansion where Mia and her roommates attend a flashy party is a mystery, but her route home is clearer. After Mia's car is towed, she walks home from the party down the curve of Vine Street overlooking the 101 Freeway. We see her walk by the Castle Argyle apartment building, then she turns right on Argyle, where she passes a mural on the wall of Hollywood Bowl Self Storage under the freeway underpass. The mural was originally painted in 1986 by Dan Collins. The panel of the mural that we see her walk by depicts actress Louise Brooks and Fatty Arbuckle. Cut off on the top of the mural are Lucille Ball, Desi Arnaz and their kids in a car. Other famous figures in the mural include John Wayne, Elizabeth Taylor and James Dean. Mia walks by the "You are the Star" mural, which, in the movie is on the outside of the restaurant where Sebastian is playing the piano. In reality, the mural is a little over half a mile west of Argyle, where she was walking, at 1648 Wilcox Avenue, just south of Hollywood Boulevard. The mural was painted by Tom Suriya, designed to place you on the stage or screen with an audience of movie stars watching you. The building itself has a cool Art Deco facade. When Mia steps inside the restaurant, she's actually in Burbank. Smoke House restaurant next to Warner Bros. Studios was used to film the scene where Sebastian is fired for playing jazz instead of Christmas carols, and where he rudely pushes past Mia, who was drawn inside by his playing. There's not usually a piano in the middle of the room at the Smoke House, but there is live entertainment on a little stage area off to the side, which for the movie, was a dark corner with a Christmas tree in it. We don't know where Sebastian's apartment is, but he says he goes five miles out of his way to get his coffee at the Retro Dairy Mart so he can look across the street at the former Van Beek jazz club, which has been turned into Van Beek Tapas & Tunes, a samba and tapas club. The Retro Dairy Mart is a real place you can visit in Burbank. It opened in 2015 on the site of a former Alta Dena Drive-In Dairy shop. Van Beek is fictional, but the location used to represent the club is, in fact, across the street from the Retro Dairy Mart. They show Sebastian drive by it as he pulls into the Retro Dairy Mart, and then you see him sitting and looking across at it. The Van Beek location is a couple buildings down, and Retro Dairy Mart is back from the street, so they had to do a bit of cinematic cheating (movie jargon) for him to be able to see it from a table at the Dairy Mart. The scenic overlook where Sebastian and Mia sing and dance is supposed to be just down the road from the party they just left, but in reality it's a relatively remote curve in Mt. Hollywood Drive called Cathy's Corner that overlooks the Valley. You'd have to walk an awful long way to find a house party from here. The wooden posts were already there, but set decorators added the bench and lamppost. If it's jazz, it must be Wednesday happy hour at The Lighthouse Cafe, a live music venue in Hermosa Beach. Wednesday Jazz Happy hour is from 6 to 9 pm, which fits right in with Mia's after-work excursion with Sebastian so he can introduce her to the wonders of jazz. The Lighthouse Cafe used to have a huge neon sign out front advertising Jazz Concerts, but the sign is long gone and these days you can hear all kinds of music there. Wednesday Happy Hour and Saturday and Sunday Brunch are still reserved for jazz. Even thought they're no longer exclusively a jazz club, they're on my list of The Best Places to Hear Jazz in LA. Which pier is that where Sebastian takes a stroll after leaving the Lighthouse? A lot of Angelenos weren't quite sure. The reason being that La La Land set decorators decided to add lamp posts in addition to the low lights that normally illuminate the Hermosa Beach Pier, so it didn't look quite like itself. The Hermosa Beach Pier is just a few steps from the Lighthouse Cafe at the end of Pier Avenue. The Rialto Theatre in South Pasadena is open and playing the classic movie, Rebel Without a Cause, when it first shows up in the movie. Later, it's closed when Mia drives by. The 1925 theatre is, in fact, closed, but is available for rent for things like, say, filming a blockbuster movie while they're looking for a new tenant. The restaurant where Mia has dinner with Greg and friends is Jar in the Beverly Grove neighborhood of Los Angeles south of West Hollywood. It's not specifically identified as Jar in the movie, so you can imagine it being a restaurant that's in closer proximity to the Rialto, because in real life, it would take her 40 minutes to an hour to drive between the two at dinner time. After watching Rebel Without a Cause, Sebastian and Mia follow James Dean's example and drive up onto the walkway at the Griffith Observatory and then spend a romantic time exploring the deserted campus and museum. You won't be so fortunate to find the place empty during open hours, but you'll get the same stunning views. The filmmakers chose to recreate the original Observatory Planetarium in the studio, rather than using the more modern version that is there now, so when you check out the show at the Samuel Oschin Planetarium, it won't look quite the same. The original Zeiss Mark IV planetarium projector, which was up in the planetarium from 1964 to 2002 - and looks like the one in the movie - can be seen in the Observatory Museum. Later in the movie, we see Sebastian and Mia on a bench that reveals a view looking up at the Observatory. That bench is fictional, so don't bother looking for it. The dating montage in La La Land includes many beloved attractions. It starts with a stroll along the Fern Dell Trail in Griffith Park. This shady trail, which is part of the The Ferndell Nature Museum, includes over 50 fern species from suspended baskets of ferns to giant tropical ferns. It is just off of the west end of Los Feliz Boulevard. There are flowering plants in this part of the park, but flowers along the trail in the movie were added by the set decorators. The Colorado Street Bridge in Pasadena is another setting for a twilight stroll. Built in 1912 as part of the original Route 66, the bridge became known as the "suicide bridge" during the depression due to the number of people who leaped to their death. This unfortunate practice continued periodically until they put up a suicide barrier in 1993. The bridge is purported to be haunted, but that doesn't make it any less popular for a romantic stroll. Sebastian and Mia grab a bite at Saritas Pupuseria at Grand Central Market. This Downtown Los Angeles public market has been open continuously since 1917, but has undergone a major hipster transformation in the last decade. Sebastian and Mia explore the Watts Towers in South Central Los Angeles, and it looks like they're on their own. However, you can only enter the structures on a guided tour, so don't expect to explore unsupervised. Watts Towers is at 1765 E 107th St, Los Angeles, CA 90002. There's a quick flash of Paul Botello's mural "Muro que Habla, Canta y Grita" (The Wall That Speak, Sings, and Shouts) at Ruben F. Salazar Park at Whittier Boulevard and Alma Avenue in East L.A.
Sebastian and Mia take a ride on Angels Flight in Downtown LA. The funicular railway used to run one block from Hill Street up to California Plaza but has been out of commission for years. As of March 1, 2017, the City has announced plans to get it running again by Labor Day 2017. The Messengers' big concert scene with John Legend was filmed inside the Art Deco El Rey Theatre on Wilshire Boulevard on the Miracle Mile in the Mid-Wilshire neighborhood of LA. The El Rey is one of numerous rental venues for live music in LA. It is reputed to be haunted. When Mia decides to put on a one-woman show, the theatre she rents is part of New Orleans-themed Club Fais Do-Do in the West Adams neighborhood of Los Angeles, south of the 10 Freeway, west of La Brea Avenue. They're know for their Boogie Down Sunday Brunch and live music on weekend nights. Five years later Mia turns into the Chateau Marmont where her husband and daughter await. Staying at this storied Sunset Strip landmark is a definite sign that Mia has "arrived". The interior shots for the Chateau Marmont were filmed at Orcutt Ranch in West Hills. A bar called Black on Santa Monica Boulevard in Hollywood was used to shoot the exterior of Seb's jazz club in La La Land. We see a movie billboard featuring Mia on the side of the building as Sebastian walks around the corner into the bar, and Mia and her husband walk in from the other direction. The interior of Seb's jazz club was filmed at the Blind Donkey, a basement bar in the East Village Arts District in Long Beach, which is about 30 miles south of the exterior shots in Hollywood. The archway at the bottom of the stairs is where they put the Seb's sign that Mia designed. They built out the stage to accommodate the grand piano, which they had to maneuver down the narrow staircase. If you're planning on visiting all these sites, you'll probably want to see this one when you visit the Mia's apartment location, which is about a mile from here.